Parking shortage? Or transit issue? 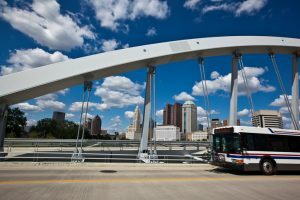 Columbus, Ohio has set to find out in an unusual way—by giving downtown workers free transit passes. The Capital Crossroads Special Improvement District, a group working to improve downtown Columbus, got its 50 members—business and property owners—to buy transit passes for their employees. Workers will be give the passes gratis and they can be used at any time, not just to get to and from work. It’s believed to be the first time a U.S. city has done this, under the theory that if you make transit simple and available, people will use it. The two-year trial will start next summer. Read more about it here.